So what exactly is Business Intelligence 3.0? Is it a mass of meaningless marketing messages, a collection of multiple BI advancements, or does it represent a single technological shift that many have misconstrued? Well, according to Bill Cabiro, it’s none of the above. In his article, What is Business Intelligence 3.0?, Cabiro contends that BI 3.0 represents two things: A changing philosophy regarding BI user types and an amalgamation, or confusion, of terms. However, Cabiro does acknowledge, from the outset, that this altering viewpoint, regarding BI’s potential use cases and therefore user types, has also led to significant technological change. This change has been driven by two interrelated factors: Technology vendors, eager to capture new market share, and organizations that have also realized the enhanced benefits attainable by delivering data-based insights pervasively throughout the enterprise. Gartner, amongst many other prominent industry analyst firms, has long advocated the benefits of making reporting and analytics accessible to broader none-technical user bases, simultaneously citing the need for BI vendors to develop product intuitive enough to be explored with minimal IT hand holding. Cabiro notes Gartner’s repeated commentary, which stipulates that “BI users do not want to read manuals”, and that they “demand intuitive BI interfaces, in line with the internet experience they are accustomed to, like Google searches or iPhone apps”. Unsurprisingly, this has led to a shift in BI purchase habits. Gartner’s recent Magic Quadrant for Business Intelligence and Analytics Platforms surveys and Dresner Advisory Services’ latest Wisdom of Crowds Business Intelligence Market Study found that business departments are increasingly driving BI purchase decisions. As a result, “product ease-of-use” has now usurped “product functionality” as the number one purchase consideration, according to Gartner. Capgemini’s Simon Gratton, in his article BI 3.0: The Journey to Business Intelligence – What does it mean?, essentially agrees with Cabiro’s premise, writing that BI 3.0 can be fundamentally thought of as “Visualization, anticipation and collaboration through a human-centred UI… with information strategy and theory focused on self-regulating mechanisms and technology accelerators”. While it’s clear that many BI vendors have attempted to address this usability issue highlighted by Cabiro, and thereby address the woeful BI penetration and utilization rates, he argues that the concept of BI 3.0 isn’t a new phenomenon. Gratton, too, highlights that the continued emergence of the category of BI technology, sometimes referred to as BI 3.0, has been a “torturous” journey: “Vendors and clients alike have, on the whole, struggled to fulfil the promise of ubiquitous information provision and ultimately widespread end-user adoption”. According to Cindi Howson’s BIScorecard report, only around 18 percent of employees currently use BI tools. To understand how BI 3.0 is different to the BI iterations of the past, recognizing the developmental roadmap that led to the current state of BI is important. BI 1.0: A tool-centric approach to BI that involves Batch processing, is tightly controlled by the IT department, and focuses on the delivery of information to an analytics trained minority (Also known today as the ‘Data Scientist’). BI 2.0: A Web-focused approach to BI that involves near real-time processing, is jointly governed by IT and users themselves, and is aimed at empowering the ‘Data Explorer’ through content delivery and creation. BI 3.0: A predominantly app-centric approach to BI, identifiable by an anywhere, anytime and device or platform independent collaborative methodology. This approach is based on social workgroups and supports self-guided content creation, delivery, analysis and management. According to Grattan, BI 1.0 “Evolved during the client/server era” and was focused on enabling individual departments to “consolidate multiple operational servers” and thereby drive operations-specific insights relevant at a departmental level. This process relied heavily on IT resources to establish reporting requirements, massage the necessary data and centrally develop the resultant reports. This phase of BI was therefore typified by narrow insight into highly specific business operations, with the dissemination of information restricted by this IT-reliant approach. Grattan suggests that the next phase of BI development (BI 2.0) encompassed schema-based BI tools that could take advantage of, and simplify access to, “the various structured data repositories of the day”. Grattan states that this approach supported the notion of the “Data Explorer” – while simultaneously relinquishing some IT control – by enabling broader BI uptake across the organization via empowering consumers to independently explore information. Or, as Grattan put it himself, BI 2.0 enabled “Enterprise Search coupled with initial attempts at consumer visualization”. This stage of development also enabled BI technologies, and therefore users, to federate information sources in an attempt to provide a single source of truth. 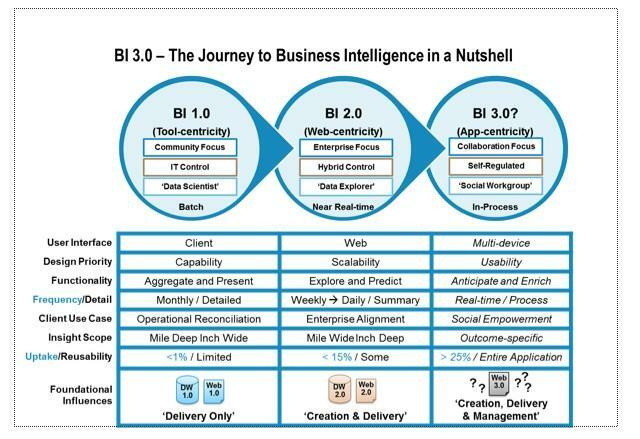 Like BI 1.0, BI 2.0 was still dominated by “operational silos and tool-centricity”. Enter BI 3.0. The article also pinpoints “a gaping void between enterprise and consumer software”, stating that it’s this gap which new BI technologies must close to ensure sustained and widespread BI user adoption (the ultimate goal of vendors and organizations pursuing BI 3.0). An article on ittechnewsdaily.com, titled 5 Tips for Maximizing Your Data Insights with Business Intelligence 3.0, concludes that the advent of 3.0 means that “BI has finally become what it should be — a core component in the continuous effort to improve business… owned by business users”. The same article also emphasizes the social and collaborative nature of BI 3.0, as well as its ubiquitous presence, stating that: “The same BI tools must be readily available regardless of the media such as desktops, mobile phones, or tablets. This ensures that users send and receive the right info, at the right time, in the right way. But, while Forrester, Gartner, ittechnewsdaily.com, Gratton and Cabiro seem in relative agreement regarding the defining features and philosophies of BI 3.0; Marius Moscovici holds an alternate point of view. Moscovici claims that the subsequent phase of industry development, BI 3.0, is actually addressing a different problem. What Moscovici does agree on, is that BI 3.0 is “about living up to its initial promise of providing data analytics to everyone… that everyone wants to consume.” Moscovici argues that integrating reporting and analytics into existing, and familiar, workplace processes and tools is “a key facet of BI 3.0 – spooning up intelligence without making users work for it”. So what are your thoughts? Which features, philosophies and methodologies best encompass and define this ‘new wave’ approach to BI?